You Are Responsible For Yourself. Iceboating is a relatively safe sport when common sense is applied and the sailing and racing rules are followed. 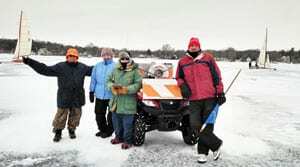 A vast majority of the time one can participate in ice boating and enjoy a reasonable and acceptable safety margin. But, occasionally we must be reminded that ice boats are still very fast and the ice is still very hard. While knowing the Right-of-way rules and using common sense works most of the time, accidents may still occur. The 4LIYC can not guarantee your safety when sailing, whether you follow these guidelines and the Right-of- Way rules or not. YOU ARE RESPONSIBLE FOR YOUR OWN SELF!! The Four Lakes Ice Yacht Club cannot guarantee your safety when on the ice. You are responsible for yourself. Ice boating is a relatively safe sport when common sense is applied and the sailing and racing rules are followed. However, accidents can still occur and injury or death is possible. Following the safety advice given on this page CANNOT guarantee your safety in all instances. Watch this video, learn, and have a plan in your mind if the day ever comes when you fall through the ice. Always wear safety picks around your neck while on the ice. Canadian hypothermia expert Professor Gordon Giesbrecht jumps in to the cold water to teach you strategies for survival if you fall through the ice. Canadian hypothermia expert Professor Gordon Giesbrecht shows you how to survive a fall through the ice. One of the most powerful forces of nature, ranking right up there with gravity, atom splitting, and the unknown powers that always make a buttered piece of bread fall buttered side down on a floor, is the force of attraction between an ice boat and open water. Though I hesitate to use the term “global warming”, it can not be argued that we are definitely experienced a warming trend the past several years.This in turn means that our sport has suffered in its search for sailable ice. The 4LIYC always tries to pick out safe ice on which to conduct our racing activities, but lately it seems that in order to get any sailing in we must contend with thin ice and/or areas of open water on the lake. This requires increased awareness on everyone’s part. Not only is sailing into open water dangerous, the publicity and the involvement of police or fire rescue units, (whether warranted or not), is not good for our sport. The Blade Runner is taking this time to offer up a few (hopefully) helpful hints on how to stay high and dry while sailing your ice boat. Find out before you set sail if the lake has any particularly dangerous or suspect areas to look out for. (Hint: they always do!!!) Ask other sailors, ask your Fleet Captain, ask an ice fisherman. Find out where the bad areas are and then stay away from them! 99.5% of the time you cannot (I repeat; cannot!!!) sail the entire lake, shore to shore in all directions. Open water, thin ice, expansion cracks, ice heaves, river and creek inlets and outlets or springs are all just waiting to inflict harm to you and your boat. I cannot recall the last time the club had to rescue someone from open water that they sailed into while competing in a club race. And yet there have been numerous times in the past few years that we had to pull sailors out of the drink who had been pleasure sailing on areas of the lake that they shouldn’t have been near. If you must go pleasure cruising at least tell someone where you plan on going so someone might know something when you turn up missing. It would be great if Buddy Melges could sit next to you, steering you clear of trouble, as you leisurely sailed around the lake. But that’s not what we’re talking about here. What we mean is don’t go sailing alone! I’m not talking about taking a passenger along for a ride, find a friend with another boat to go sailing with you. I know this has the potential of being two boats in the water but in practice it seldom works out that way. There are several things you can and should do in order to help yourself should trouble occur on the ice. 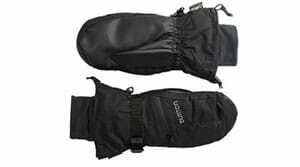 Carry a set of “Bear Claws”These are like ice picks that can aid you in climbing out of the water and onto the ice. A inflatable life jacket is a great idea. 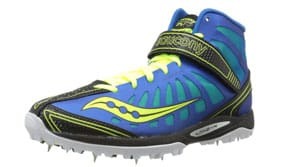 Some racers already have them, they are unobtrusive and at about $75.00 pretty cheap insurance. A cell phone and a length of rope in your boat may not be a bad idea. Of course you should always dress appropriately, have some sort of ice creepers or spikes for your boots, and use a decent helmet. In most cases your boat will not sink to the bottom when you sail into open water. You, on the other hand cannot (I repeat, CANNOT), stay afloat too long in icy water. The cold water drains your energy much faster than swimming does in the warm summertime. Your clothes, when wet, may seem like you’re carrying an anchor with you as you try to swim for it. Stay with your boat, it is the best chance for your survival. Yell like hell for help. [Carry a whistle, too!-Ed. ]There you have it, a few common sense things to consider when ice boating. Most of this advice is directed at the pleasure sailors out there, (and therefore will probably never see this article), but it’s pretty sound advice for all of us. 1. Know the sailing and Right-of-Way rules. Pay your dues, join the club, get your copy of the By-Laws and Racing Rules. Study the racing rules until you really know them. 2. Never sail alone. Use the ‘buddy system’. The lake is never one large sheet of ice that can be sailed on in all directions, shore to shore. The ice is never the same thickness all over. Six inches of good solid ice in one part of the lake does not mean that somewhere else on the lake there won’t be thin unsafe ice, or even open water. 3. Early and late season ice requires extra caution. Early season ice is not fully formed on the entire lake. Springs, river inlets and outlets, and warm water outlets, like MG&E, can make for areas of thin ice where you least expect them. Pressure ridges can appear over night, often in areas that were sailable in previous days. Ducks can keep large areas of the lake open even after long periods of freezing temperatures. 4. Is racing safer than pleasure sailing? I’ve always thought that racing is safer than pleasure sailing because the club has looked over the sailing area and picked out the best ice on which to race. A smooth surface, thick enough ice, no large cracks, no open water, are just a few of the things that the club looks for before we set up the marks. We also have the clubs safety equipment, and the ATV emergency vehicle keeping track of the boats which are racing. Sure, the club will come to the aid of anyone who needs it, but on a lake the size of Mendota we may not even be aware of the need for assistance in areas far away from the race course. 5.Talk to others on the lake. Talk not only to fellow ice boaters, but to ice fishermen as well. Get as much information as you can on the condition of the lake. Even if you plan on racing with the club don’t assume that you can sail straight out to the race course. The club tries to set up the course on the best possible ice, but on many occasions you may have to sail over some rough ice, or cross some larger cracks to got to ft. Find out where the problem areas are before setting out. 6. Dress for the occasion. You would not believe how many times over the years I’ve seen people, on the ice, not dressed warm enough. This is, after all, winter in Wisconsin. When you are cold, not only will you not enjoy the sport, the cold will affect your thought process. It’s easier to make bad decisions. Bad decisions can lead to accidents. Dress warm! Get yourself a decent helmet. The 4LIYC requires a helmet for racing, but even if you are not racing a good helmet is a safety must. Notice how many of the serious racers use the full-face style helmets. Be sure to have ice creepers on your boots or some type of spiked shoe. It makes walking on the ice safer and they are necessary for starting your boat. 7. Carry a few safety items in your boat. Perhaps a small length of rope and some sort of small ice picks, often called ‘bear claws’, to help yourself climb out of open water. Some carry a distress flair. Maybe even a cell phone, especially if you are pleasure sailing. 8. Check and re-check your boat over during the course of the day. Make sure all your pins are in. Check to see if the bolts have the nuts on them. Check your safety pins and any safety wiring. I’ve seen many times where snowdrifts have knocked pins out during the course of the day. DNers, check your bob stay. Give your boat at least a quick going over before each race. 9. Establish a maintenance program for your boat. When back at the shop or garage between weekends, check all your equipment for wear and tear. Replace worn items as needed. Keep your runners sharp, dull runners on a windy day can definitely be a safety concern. Check your wood or fiberglass parts for stress cracks or other damage. Keep your sails in good condition. 10. ALWAYS USE COMMON SENSE AND EXERCISE GOOD JUDGMENT. Whether racing or just pleasure sailing, sail smart and safe. Avoid collisions at all costs, even if you are being fouled by another yacht during the course of a race. That’s what we have protest forms for. Don’t sail beyond your experience and limitations. If it’s blowing 35 mph, get off the lake. You can bet the 4LIYC won’t be racing in those conditions. "Think Ice Safely & Rules of the Road"
An ice safety essay by Maine iceboater Lloyd Roberts. It’s the best one ever written and worth reading and reviewing a few times every season. Read it here. The key to successful iceboat racing and keeping safe on the ice is preparation. Know what to do if you find yourself on the ice and unable to see the shore because of low visibility. On a relatively small inland lake, you likely will find your way to shore; losing your bearings on big ice, particularly one of the Great Lakes, could be deadly. Having a plan in mind will keep you safe. Designate a friend or two to be your buddy-of-the-day and agree to keep an eye on each other during the day. Inform the Race Committee if you lose track of one of your friends. Orient yourself – situational awareness is vital! As you head out to the race course, look around and commit geographical landmarks to memory. Is there a tree much taller than the others, a brightly colored building, a water or cell phone tower near the launch? Once out to the course, take another visual check of landmarks. Are you west, east, north, or south of the launch? Is there any open water that you need to be concerned about? Even on a sunny day it’s easy to become disoriented. Know where you are in relation to the launch. Buy a plain old fashioned compass and keep it in your sailing jacket – permanently. Be prepared if there is no cell phone service out on the lake. 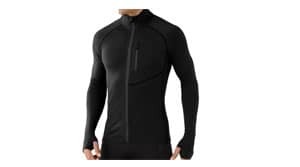 Amazon sells many different models including one you can attach to your zipper. On low visibility days, those already at the launch should think of themselves as lighthouses. Position vehicles towards the lake and turn on lights and flashers. 1. BRING YOUR FULLY CHARGED CELL PHONE! I can’t stress this enough. We all have one and it could save your life. For extra piece of mind, purchase a small inexpensive portable charger that you can keep in your coat pocket in case the cell phone battery runs down. You can buy them from Amazon or dozens of other retailers. Make certain you have the cell phone numbers of your buddies and some key race committee members. Download and install a compass application on your phone. Do you know how to drop a pin and save it? Dropping a pin means identifying your location on Google maps. When I arrive at a new launch, the first thing I do is open the Google maps application on my phone, drop a pin, star it, and save it. Then when I open the Google map, the launch location appears on the map as a yellow star. If you aren’t a high tech person, practice this. Here’s how to do it. At the 2017 ISA, a late afternoon snow storm reduced visibility to less than half a mile. Even though we could not see the shore, it was a relief to confidently navigate the race committee vehicle to the launch using my phone’s Google map. 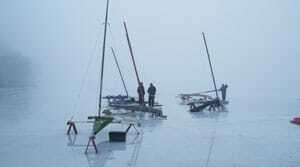 What to do if you are on the lake with your iceboat in low visibility or darkness. If you are stranded in the middle of the lake, drop a pin, and share it by texting or emailing to those who are coming to help you! Practice this using the link above. If you make it to shore, let someone know. Don’t place those who are out on the lake looking for you in danger or keep them from helping other people! Knock on someone’s door and explain your predicament. They will generally be happy to help you out and let you use their phone. You’ve been told that help is on the way. Please remain calm and be patient. Out of respect, older sailors will always have priority with tows. Those farthest out will also have priority in order to keep the rescuers safe. And don’t forget to thank the person who came to tow you in to the launch. The purpose of the rules is to prevent collisions! 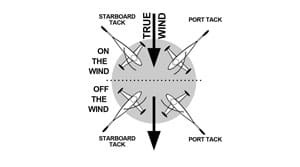 If you are new to iceboating or have been sailing for years, please take the time to study this graphic. There are some major differences between soft and hard water racing rules! Iceboat Racing Right of Way Rules Graphic. We consider wearing a set of ice picks a necessity for added safety. Ice picks are worn around the neck and in the event of a fall through the ice can help to pull you out out onto the ice. 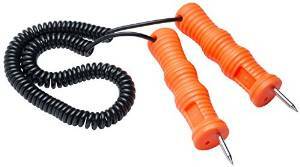 Ice Safety Picks available on Amazon. 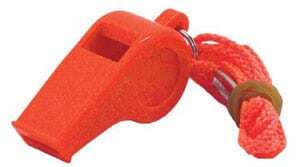 Though we don’t recommend sailing alone, if you find yourself away from the group and in trouble, a safety whistle is added peace of mind. Safety Whistles on Amazon. Some sailors chose to wear dinghy vests over winter clothing. 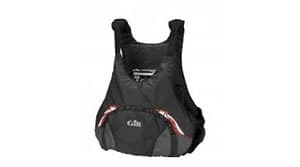 Many manufacturers warn against wearing inflatable safety vests under clothing because of risk of injury. PFDs on Amazon. Beware the Hazards of Ice! A look at proper rescue procedures for someone who has fallen through the ice and discussion about ice strength which depends upon thickness, snow cover, changes in temperature, depth of the water under the ice, water flow (current), and water level. From Boatsafe.com. Learn the right ways to check ice and learn the different types of ice. “The highest hope for this website is to help save a few lives. The following outlines four basic ways to minimize the chances of the worst happening.” Lake Ice website. A good day of iceboating begins with preparation. The proper gear keeps you warm which keeps your focus on having a fun day on the ice. Do not even think about sailing an iceboat without a helmet. Helmets are mandatory. 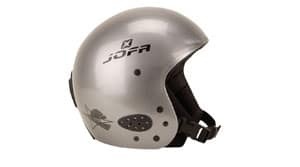 Lighter weight helmets, particularly Jofa, are very popular with adult DN ice boaters and are a perfect fit for kids. We highly recommend the full face attachment. Website: Reliable Racing. Giro’s Sestriere ski helmet is another option. 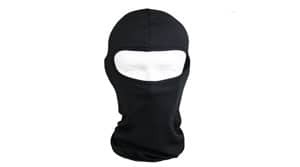 You want to keep your face warm, right? They are also helpful for keeping your neck warm. Wearing a scarf while iceboating is dangerous because it could get tangled in the sheet rope! Available everywhere and on Amazon. Years of experience has shown that mittens are warmer than gloves when it comes to ice boating. Use your gloves when setting up a boat. For sailing, heavy-duty mittens are the best. Ask around for mitten recommendations. 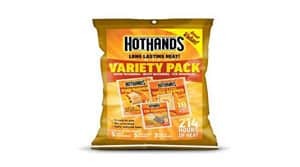 Chemical hand warming packets are handy on the ice inside your mittens when you are not actually sailing the boat. Amazon has you covered. Goggles protect your eyes not only from the wind but from ice chips. 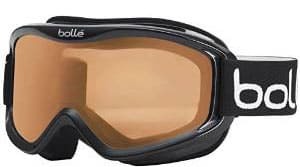 Ski goggles on Amazon. For traction, ice cleats, also known as creepers, are mandatory. Please don’t even try to sail an ice boat without cleats. 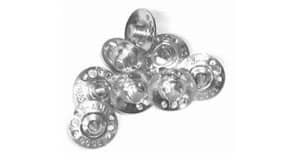 Removable spikes can be purchased at a Farm and Fleet (look in the ice fishing section) at a reasonable cost. 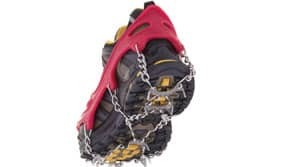 Ice cleats on Amazon. This book by Lloyd Roberts and Warner St. Clair is THE definitive book on DN building, tuning, racing and sailing. Mainly about DN iceboats but relevant to all iceboaters because it covers safety, clothing, how to load the car- it’s all in here! Updated with instructive commentary by many top-flight iceboat sailors.